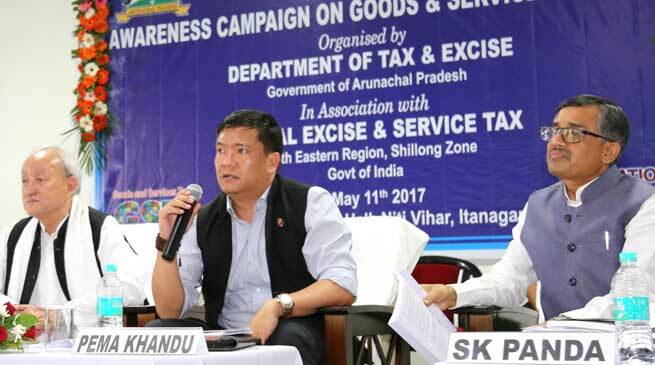 Chief Minister Pema Khandu today attended an awareness programme on Goods and Services Tax (GST) organised by the Arunachal Pradesh department of tax and excise in association with central excise & service tax, North Eastern, Shillong zone. The programme which was conducted a day ahead of special assembly session called to pass the GST legislation was also attended by BJP legislators, deputy commissioners and officials from the tax and excise department. Speaking on the occasion, Chief Minister appreciated the Prime Minister for bringing in an investment friendly tax reform, which will benefit the country as well as Arunachal in big way. Once GST is implemented, all entry gates erected in the name of collecting various taxes will be abolished leading to check in revenue leakages, he said. Taking note of the vast geographical area of the state, the Chief Minister informed that five regional offices will be set up for GST implementation. He also announced that training will be imparted to officials in handling matters of GST at all district level. To address the gap in IT infrastructure for successful implementation of GST, he informed that the matter has been taken up with IT ministry and was discussed in NITI Aayog meeting held recently in New Delhi. He also informed that the state cabinet will soon discuss on process to get GST registration which will check dilution of trading license by non APST traders who had been evading filing of tax returns and non payment of income tax. Chief Secretary Shakuntala Gamlin in his speech thanked the Chief Minister for his pro-active initiative for holding the awareness programme on GST. She spoke on the need to demystify the thought and philosophy of GST to get the new tax regime into the minds of those who are not into tax culture. She said the broadening of tax base through GST will benefit states like Arunachal which is a net consuming state and that depends totally on centre. Also GST will provide new revenue base for Arunachal from sources like businessmen and private companies. She said the new taxation will provide equal level playing field for all – where consumers will not get distorted price, where there will be no fear of inflation and market will be corrected. Earlier Chief Commissioner of Central Excise, North Eastern region, SK Panda spoke on GST law that has been simplified to override the earlier complex taxation structure. He said the GST is simple and a law that is meant for the common masses.